This past weekend I connected with my colleagues (and friends) BA Norrgard and Lee Pera to teach a Tiny House 101 Workshop in Washington, D.C. Our twenty students joined us from various locales ranging from down the street to Florida to Brazil! I look forward to teaching a Tiny House 101 Workshop again in June in Denver, CO with BA Norrgard. If you'd like to join us, please register now so we know you're coming! On Friday Isha and I rented a truck from one of our landies at Simply Home Community and drove over to Iron Eagle Trailers to pick up our trailer. For those of you who haven't yet built a tiny house, this is the equivalent of a groundbreaking. It's a big deal because getting the trailer to the build site is the very first thing we do to make the build real. We gave our 24' long, 8'5' wide PAD series tiny house trailer the once-over and then signed our paperwork with Mary in the office. Rob helped us get the trailer connected to the truck but we then discovered The Hiccup. (See A Tiny Move for My Tiny House for more about discovering The Hiccup): we realized that we had a 4 prog light connection on the truck and a 7 blade RV style connection on the trailer. Fortunately, there's a hardware store just a few blocks away that sells the adapter. Unfortunately, they were sold out of have the adapter we needed. Fortunately, Isha was able to figure out which parts we could use to piece it together and when he handed them to Rob, Rob said "Okay, just give me a moment!" Rob came back less than 5 minutes later with a Frankensteined contraption that worked perfectly to connect the truck lights to the trailer lights. Then Isha and I parted ways for a couple hours. I dashed off to do an on-site consultation for a family exploring the possibility of putting an ADU on their property. Despite the rain, we had a great time talking through their options. Meanwhile, Isha drove our tiny house trailer down to our build site, Green Anchors, where Matt helped him get oriented to the tiny house cluster. There are 7 tiny houses under construction at Green Anchors right now and one other bare trailer besides ours. Matt says there are at least five more coming. It's so cool to see this exponential growth! 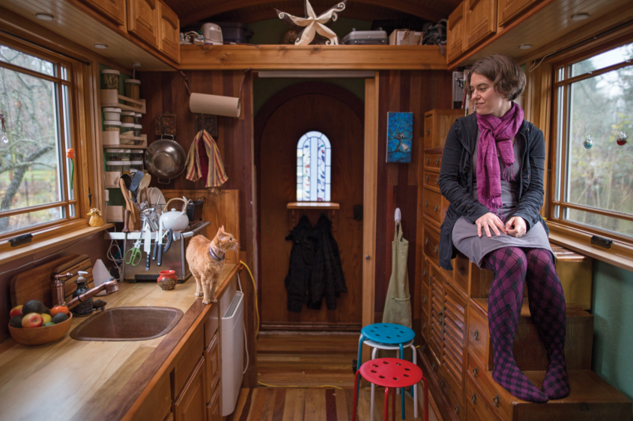 The year before I built The Lucky Penny at Green Anchors, there was one tiny house (Nicholette and Mitchell's tiny). The next summer my build buddy Laura Klement and I built our tiny homes side-by-side. Last summer there were a handful of tinies constructed at Green Anchors. And this year there will likely be a couple dozen. Woohoo! Friday evening Isha and I reconnected at Green Anchors to tarp our trailer and get me oriented to site. We celebrated our trailer delivery - and date night - with dinner at Proper Eats. Today we'll be getting ourselves set up on site in preparation for tomorrow's T42 Build Blitz. Yesterday, on a gorgeous spring morning, my landie Jake and I rode our bikes down to the Native American Center at PSU to attend the Small Scale Developer Bootcamp hosted by Eli Spevak of Orange Splot, LLC and John and Jim from Incremental Development Alliance. These three incredible people teamed up after meeting at an event last year. Eli told Jim and John that Portland has lots of people eager to make our neighborhoods better places through creative, community-oriented small scale projects. They scheduled a one-day bootcamp for the summer of 2016. But as more and more people contacted Eli with questions over the winter, he realized the demand for this information was even greater than anticipated, so he convinced John and Jim to bump the training up. They agreed and had the opportunity to present to a sold-out crowd of more than 100 people yesterday! The event actually kicked off on Tuesday evening with a set of presentations by small scale developers at The Zipper, a fun new food court with local independent restaurants created by Kevin Kavanaugh of Guerrilla Development. It was fascinating hearing about all the small-scale residential, live-work, incubator, and mixed-use spaces that have been created. A special focus of the bootcamp was missing middle housing, a term coined by Daniel Parolek to describe the mid-density housing that most American cities quit building many years ago and now sorely lack. Daniel was there for the bootcamp to describe missing middle housing - you know, like fourplexes, garden apartments, rowhomes - and its role in our urban fabric. It was heartening to see so many people in Portland eager to learn about how they can play a part in making better neighborhoods by filling the gaps in our urban fabric with missing middle housing and small mixed-use projects. It was also fun to recognize so many faces in the room and meet new people. I'm glad I was able to participate and I look forward to seeing what happens in Portland over the next couple years as a result of the Small Developer Bootcamp! Later today I'll be one of the guests for a radio show on Biz503 (a segment about business in Portland on the Portland Radio Project station). This particular episode is focused on the future of sustainable building and I am honored to be one of the panelists, along with fine folks from Sustainable Northwest Wood - which provided most of the lumber for The Breathe Building, Earth Advantage which is the standard the Breathe Building was built to, People's Food Co-op - where I'm a member, and several more! I look forward to sharing a bit about Simply Home Community and I imagine we may also discuss The Breathe Building, the ADU Case Studies Project, the Space-Efficient Housing Working Group, and other sustainable building projects I've been part of here in Portland. Read on for the blog post Biz503 wrote to preview the show and tune in if you can!